At the beginning of 2019, there were 87,000 student accommodation beds across Australia’s eight capital cities and according to Savills’ projections that number will increase by 32 per cent to 114,750 by the end of 2022. But with international student enrolments at Australian universities growing at an exponential rate, the student accommodation boom won’t be able to keep up with the strong demand for beds, Paul Savitz, Savills’ director of student accommodation, said. “There’s still a major undersupply and we haven’t even factored in domestic students,” Mr Savitz said. The assumption that international students will grow “at an exponential rate” is ludicrous. 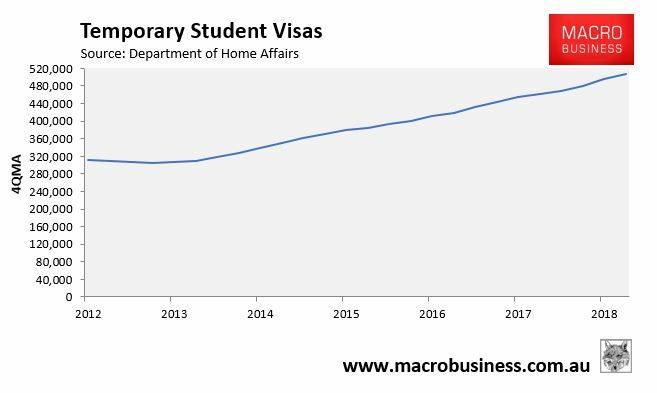 Third, Australia’s biggest market – China – is increasing investment in its own universities and lifting its standards, thus is likely to stem the flow of Chinese students arriving in Australia. Not to mention that as China slows and its interest rates fall, it will be forced to protect its currency against capital outflow via capital controls that will eventually tip into the trade account with limits on students and tourists. That’s aside from the possibility of punitive action by China to curtail numbers as Cold War 2.0 intensifies. Australia’s universities have become dependent financially upon international students. And the need to attract, year in and year out, huge numbers has impacted on the prestige-value of an Australian qualification in the international market-place. University standards have also plummeted in order to keep international student numbers (and profits) flowing. There is ongoing pressure to go easy on international students when it comes to language skills, and if possible, to pass low performing students. The situation has become so bad that the Victorian Government in January called for a review of entry requirements into Australia’s universities after irrefutable evidence had emerged that international students with poor English language proficiency are badly eroding education standards and placing intense strain on lecturers and university staff. This was followed immediately by academics admitting to Fairfax that they had lowered teaching standards and passed failing international students in order to maintain the foreign student trade. The international student association also called for greater regulation of overseas migration agents amid widespread cheating on English tests to gain access to Australian universities. Whereas multiple recent Australian reports (e.g. here, here and here) have raised the alarm that the deluge of international students had degraded Australian university standards. The above factors are compounded by increasing competition from universities abroad (including from China) as their standards improve. This will make it increasingly difficult to attract high quality international students, who are more likely to study at home (or elsewhere). Unlike with commodities, Australia has no natural advantage in university education. Rather, one of the reasons why education exports have grown so much is because they are a pathway to Australian residency. I’d even go as far to say that Australia is primarily selling permanent residency rather than education. To sell overpriced degrees to overseas students, it is necessary to be able to offer the byproduct of permanent residence for graduates. Any reduction in the immigration numbers would make that sell quite a bit harder. No doubt, there was a bit of wink-and-nod between the government and the vice-chancellors on this topic. 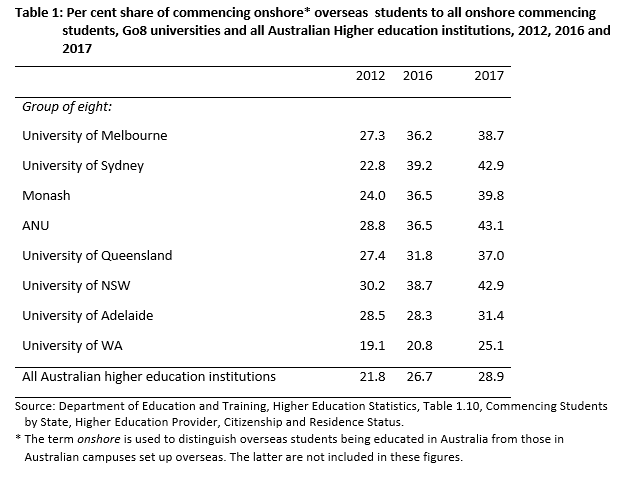 In other words, if the incentive of permanent residency was removed from Australia’s ‘education exports’, then Australia’s attractiveness as a place to study would evaporate and the international student trade would collapse. It started with the Dawkin ‘reforms’ …. nothing but a corrupt farce destroying what was a world class university system …..
Thats why they wont remove the incentive of permanent residency! Get them young, give them a University hazing, and before you know it, you have created an Aussie! When the job market falls over the numbers will drop.